LANSING, Mich. — State Sen. Mike Shirkey, R-Clarklake, stands in the Senate chamber with Branch County Republican Party Chairman Dennis Armstrong (left) and Hillsdale Hospital Director of Organizational and Business Development Jeremiah “JJ” Hodshire (right). 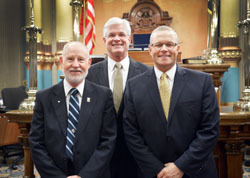 Armstrong and Hodshire joined Shirkey for Gov. Rick Snyder’s seventh State of the State address Tuesday night. Note: For a print-quality version of this and other Shirkey photos, click the image or clicking Photowire, below.